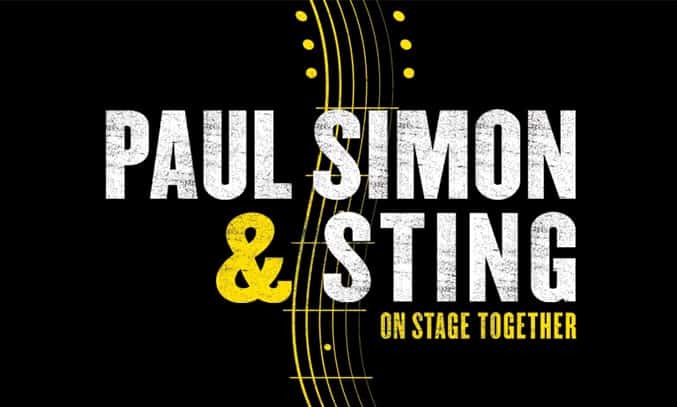 Paul Simon and Sting aren’t two artists you’d usually put together, particularly when you consider that they aren’t exactly similar in musical style. Sting’s songs are catchy, energetic and a little silly. Simon’s songs are graceful, complex and loaded with meaning. Yet, somehow the collaboration works. The duo performed for the first time together at a charity benefit for the Robin Hood Foundation last year and enjoyed it so much that they decided to take their performance on tour. The gig at the Manchester Arena is one of five dates in the UK, which also sees the duo perform at Glasgow, Birmingham and London. The marathon three-hour gig starts with both artists performing a medley of hits from their collective musical history, backed by a 17 strong band. The set opens with a fantastic version of Brand New Day with vocals and guitar performances from both Sting and Simon, before moving swiftly into The Boy in the Bubble and an interesting interpretation of Sting’s Fields of Gold. The artists then break away to perform mini-solo sets which are both excellent in their own right. Sting takes to the stage first to blast out reggae-rock classics of his former band the Police including So Lonely, Walking on the Moon, a high energy brass version of Message in a Bottle, as well as some solo tracks including Englishman in New York, Driven to Tears and The Hounds of Winter. The singer may be 63 years old but his greatest strength is still his heart-warming upper register as demonstrated in the full-throated version of Roxanne. The highlight of the solo set is when British singer-songwriter takes on Simon and Garfunkel’s epic fable America with just a baby acoustic guitar for an emotional performance that is unlikely to be forgotten. In contrast to Sting’s high energy set, Simon’s solo performance is more subdued and graceful. The 73 year old skipped through his many musical genres from the playful 50 Ways to Leave Your Lover to the Rhodes piano-driven Still Crazy After All These Years and a rattling cover of Mystery Train. Diamonds on the Soles of Her Shoes, Me and Julio Down by the Schoolyard and You Can Call Me Al provide the most energy and have the audience on their feet. The singer-songwriter is at his best however with the intricate Hearts and Bones and the unexpected performance of Homeward Bound which does not form part of the original set list. The highlight of the show is when the two musical powers join forces on stage to collaborate their extensive back catalogue. Classics such as Mrs Robinson which is given a Southern Blues makeover and Fields of Gold are revamped. Sting and Simon also share vocals for the delicate ode Fragile for an impressive performance which had the Manchester audience on their feet for a standing ovation. The show culminates in a memorable encore of Cecilia, Every Breath You Take and Bridge Over Troubled Water, beautifully performed with Sting on vocals, as well as an acoustic cover of the Everly Brothers hit When Will I Be Loved? Disappointingly, the collaboration of the two backing groups at the start of the show drowns out the vocals but this is quickly resolved when the duo break for their mini-solo sets. The marathon three-hour set also lacks an interval, resulting in the audience becoming restless at times with many guests leaving their seats to get a drink or take comfort break. Despite this, the performance is well worthy of the high ticket price, particularly when you consider that is likely to be an once-in-a-lifetime performance. The songs may be classics and the artists may be greying but Paul Simon and Sting are still more than capable of captivating an audience. An excellent performance by two musical legends.